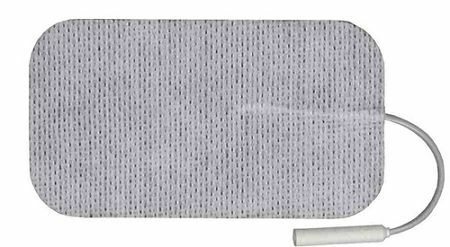 TENS Pros Premium® TENS Stim Electrodes 2.0" x 3.5"" rectangle, White Cloth, Carbon Layered, TENS Pros Gel, Reusable electrodes. I have been using these electrodes for the past year or so, and I am very pleased with the quality, durability and price! I can use the same electrodes many times over. TENS Pros sends items quickly, and and provides excellent customer service! Theses pads are awesome. They are sticky and they hold very well or the duration of the treatment. So overal, very happy with my purchase. I love the 2x4" electrodes because I can use my TENS on my hip and my knee at the same time. These are a good price. You can make them last a LONG time with the conductive spray. I have had migraines, really bad migraines, for years. I have been to a slew of Drs and tried physical therapy and chiropractors many times. And then I found out about a personal TENS unit! I cannot say enough about how totally happy I am with the products I have, the short time it took to receive them and the great price I paid for the high quality TENS electrodes I use often. So thank you for having great quality at a price I can fit into my small/tiny budget! I LOVE these. Not only do they cover more area, but they do not come loose as easily and they have lasted longer than any of the smaller patches I have had, and I have tried several brands. These were the least expensive and the contact surface has just the right amount of gel to maximize the effect. Quick service and they made a small error in a good size order, and fixed it immediately. this item worked just as described. this is the second order for pads. the quality, price, and service are all excellent, and I will continue to purchase from this company! These are a great size for larger areas such as the back. Great value as well. They were more expensive than some competitors, but you truly get what you pay for. The Tens electrodes are more tacky and last longer..will re-order ! Work good but gel seems to peel off too quickly. Can reuse only about 3 or 4 times. My wife loves these and the 3 inch rounds as well. She does prefer these 2x3.5 as it covers more of her painful areas. They do see of great quality, and we've never found the adhesion to drop. The price makes it easy to dispose of a 4 pack every 2 months. Plus, you have no regrets if you pull the wires out of the pad! These 2x3.5 electrodes have held up well considering I have worked in them. The price is well worth it. I would highly recommend this product along with the tens-pro 7000. This company stands behind their products too! these work great. found relief using these with my tens unit. the size is perfect. will be reordering more of these soon. The electrodes perform very well. The backing is very adhesive,superior to other pads I've had that cannot be used more than once or twice at best. I purchased these for my mother, who uses a TENS unit for a pain issue from a wreck over 20 tears ago. The pads work just as well as the expensive ones - for much less! Perfect electrodes at a perfect price. Great quality. Recommended. Thank you! good prices, good service and true delivery time. These are the best ones by far of any I have tried. I use these all day every day and the adhesive just keeps on sticking. The wires are also secured better in these than others I've used. I have yet to have one pull out if I get snagged on something. This is a top quality product. I will absolutely purchase these again if they ever wear out. Q: Are these one use pads, or are they multiple use pads? 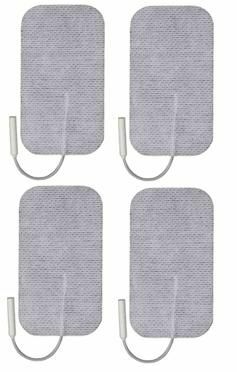 The electrodes come with adhesive gel already on the pads, and are durable enough for about 10-15 uses by the average user for each pack of 4 pads. Eventually, you will notice that the pads dry up and do not stick to the skin very well anymore, upon which you may apply our Conductive Spray (sold separately), to temporarily rehydrate the pads to get a few more uses out of them, or you may just simply discard that used pack of electrodes, and switch to a new pack of 4. Q: Are these electrodes compatible with my Empi Select TENS unit? You should have no issues using any of our electrodes with your EMPI Select unit. Q: Are these electrodes self adhesive ? Yes, these electrodes are self-adhesive with the gel already on them. Q: Are these compatible with LG Tec Elite? You should have no issues using any of our electrodes with the LG Tec Elite. Q: Are these compatible with Empi tens units? Yes, all of our electrodes, including these, have the same industry-standard 2mm pin-style connection for where the lead wires of most portable TENS units plug in to, so you should have no trouble using these, or any others we carry, with your EMPI device. Q: Will these pads work for a MAXTENS 1000? All of our electrodes should fit just fine with the lead wires that come with the MAXTENS 1000 device.